Despite the absence of five of last year’s top six finishers in last Saturday’s Seeley Cup race in the Ormeau Park which incorporates the Northern Ireland 10K Road Racing Championships it turned out to be a n exciting, high quality duel in the sun writes Joe Quinn. The race was seized by Annadale Striders from the gun with in form Paul Pollock , Owen Carleton and last year’s runner up Paddy Hamilton setting a blistering pace followed by the quartet of North Belfast’s Alan O’Hara and Eamon White, Foyle Valley’s Scott Rankin and East Down’s Brendan Teer. 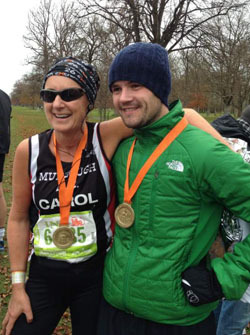 Carol McMenamin of Mourne AC with Gavin Oakes of East Down AC at the Dublin New York Marathon. But it appeared that Pollock was simply biding his time during the first 2 circuits. On the last lap he simply eased away fro Hamilton to win by 9 seconds in 30.40 with Rankin powering through to catch the tiring Carleton with Teer taking a creditable 7th place, which was 7 places higher that last year. Neil McCartan was next East Down man to finish, reportedly disappointed with his time of 35.11, as most of us would be! At the opposite end of the emotional spectrum Barrie Atkinson was over the moon at setting a new pb of 35.22 by knocking a minute and a half off his previous best and leaving him with a smile which will last a week. And then came Liam Keenan, a superb 38.25 to herald his recovery from mid Summer surgery and a further strengthening of the Cross Country squad for the weeks ahead. Sunday dawned frosty, sunny, bright and very cold, ideal conditions for the early afternoon cross country races in Castleward for the 3rd round of the McGrady Financial Services Series and in the event 118 boys and Girls from P4 age upwards turned out for an exciting afternoon in the shadow of the magnificent house. On his debut outing for the club East Down’s Michael O’Connor put the first points on the board with a deserved start to finish victory in the P4 Boys race with Ruairi Cunliffe taking a creditable 9th place. In the girls equivalent Colleen Burke did well to finish 3rd with Isabella Ferreira and Claire Lundy 7th and 9th respectively. In the P5 Boys race Jack Rice led the East Down trio home ahead of Ethan Cunliffe and Christopher McMullan. While Louise Lundy took an excellent second place with Lucy Morgan, Laura Doran and Niamh Fionda making up the quartet of East Down runners. In the P6 Boys race Domingos Ferreira and James Byrne ran strongly all the way to take 4th and 5th places respectively and showed plenty of potential to improve on those in the races to come. With 5 runners in the P6 Girls race East Down were expecting more points and were not disappointed with Natasha Savage’s 3rd place followed by Libby Maloney, Grace Surginor, Aoife Burke and Caitlin Burke in 5th to 8th places. Only 2 East Down Boys turned out in the P7 Boys race over 1,000 metres but the race was dominated by All Ireland qualifier Caoilin Quinn who cruised to victory. Good luck to him in Ratoath Co. Meath next weekend. He was backed up as usual by never say die support from the courageous Adam Morgan. Chloe Galloway made a welcome return to action in the P7 girls race and took second place in a well judged race while Edie Carroll caught the eye not far behind in 4th place. Year 8 Girls was dominated by Newcastle who filled the top 5 places led by Sarah Dougherty with Louise Sweeney, Mary-Jo Tumelty and Louisa Byrne filling the next 3 places. In the Boys Year 8 test over 2 tortuous laps Owen Edwards was in contention for 2nd place until being beaten on the run in by James McKeaveney Burren AC and Eoin McCrickard from Newcastle in the best race of the day. 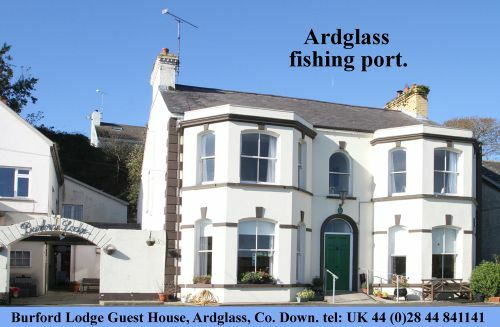 Padraig Rogan continued to show improvement in 7th place and is getting stronger all the time. Year 9 proved to be an East Down benefit in both Boys and Girls races with no athletes from Newcastle or Burren appearing. The Boys actually benefitted even more than the girls, being required to do only 2 laps instead of 3 because the spectators were feeling the cold! In the event Matthew Carrick dominated, finishing clear of good efforts from Christopher O’Connor and Daniel Atkinson. Olivia Mooney held on well to win from the fast finishing Laura Green with good all round performances from Aoife Cochrane, Elisha Surginor, Ella Carroll and Eimear Connor. Marc Breteche worked hard and finished fast in the year 10 Boys where he was the only East Down representative while Tom McMeekin was a man alone in the oldest age groups with Dearbhla Magee from Newcastle doing likewise for the Senior Girls. Caitlin Stewart and Chloe Daly gained valuable points for finishing the Girls race and will improve from the experience. On what turned out to be a bitterly cold day, I’m told, everybody could be proud of their efforts and for giving parents and friends a very enjoyable afternoon of sport. The biggest vote of thanks has to go to Club coach Kim Surginor who must have ran about 5 miles as she accompanied every tail ender to the line. She certainly didn’t feel the cold! A unique and historic event took place in Dublin on Sunday morning when the New York City marathon took place in Phoenix Park. The hastily arranged substitute for the cancelled race of 2 weeks ago was open to all from these shores who had been disappointed by the necessary decision on the heels of Hurricane Sandy. Privileged to be among the 147 runners who managed to be there was East Down’s Gavin Oakes and Carol McMenamin from Murlough. What a tale they will have to tell their grandchildren in years to come. Gavin finished in 3.45 and Carol in 4.00 hours to become part of a small band whose feat will never be repeated, such is how history is made. Congratulations to them. Next weekend is the Griddle 10K and Fun Run at 12.00 noon from Saul GAC and a big turnout is expected from all the local clubs. If you’re not running why not come and cheer the runners or perhaps lend a hand with marshalling.